Nature is the last thematic section of gap in the air. 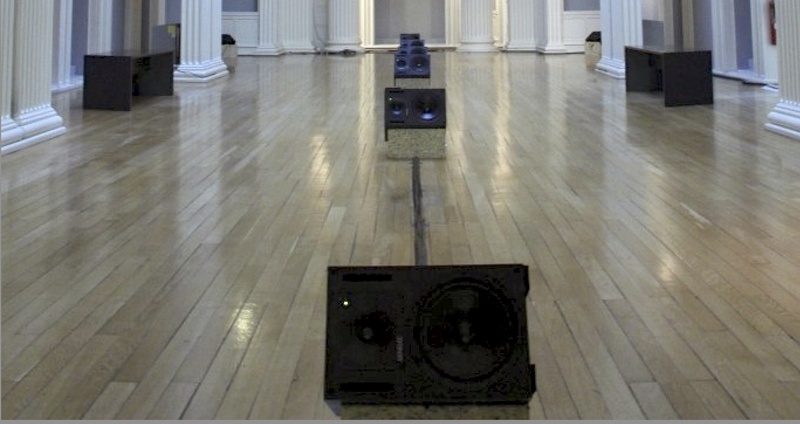 The present installation focuses in on the sound within this specific gallery space by appropriating uncalled for and unwanted noises and, in doing so, directly addresses one of the overarching questions posed by gap in the air: How does sonic art challenge art galleries? Limits to Growth is a sonic parasite that feeds from the auditory environment of the gallery space in order to make itself heard. Over the course of its infestation, its relationship to the environment will change. Initially the system is closed, prescribed and deterministic. However, as time passes a sequence of interventions will see the work ‘mature’ in situ, establishing a niche. By the end of its time, it will have developed from something closed to something more structurally coupled to the environment, where behaviours and transformations of sound are themselves driven by what it ‘hears’ (including, of course, itself). The creaking floors, peculiar resonances and traffic through the Georgian Gallery may have imposed themselves upon previous works, this time they serve to feed it!